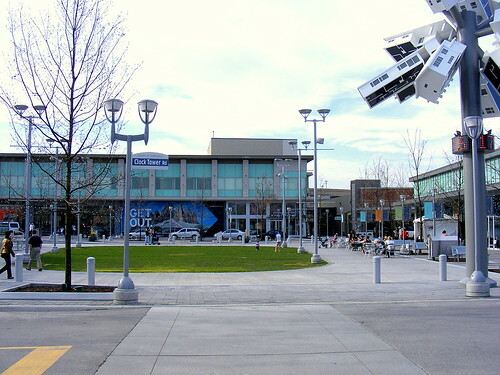 Last week, the new Shops at Don Mills opened at Lawrence Avenue and Don Mills Road, in the heart of the pioneering 1950s suburb developed by EP Taylor.The new commercial property, developed by Cadillac Fairview, is an example of a “lifestyle centre”, replacing an earlier mall that was demolished, despite some local opposition, in 2006. 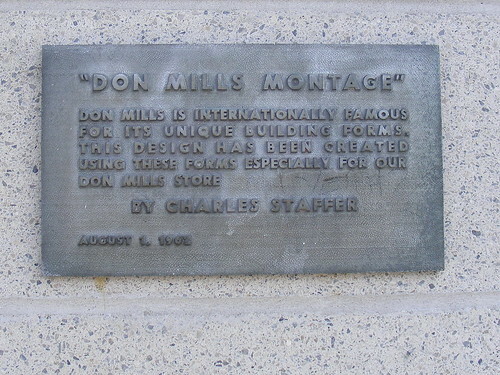 As built, Don Mills was meant to be self-contained, with housing of various types (detached ranch-style houses, townhouses and low-rise apartments), industry, and community uses such as shopping, recreation, and schools. The original mall, opened in the 1950s and one of the first Eaton’s stores to open outside a city’s downtown core, was originally outdoors, with covered walkways, as was the fashion of the time. A renovation in the 1970s expanded and enclosed the mall, which served as the natural meeting space and community hub of the neighbourhood. The new lifestyle centre is almost “back to the future”, bringing the stores back outside facing private lanes with parallel and angled parking, almost like a genuine neighbourhood retail strip. 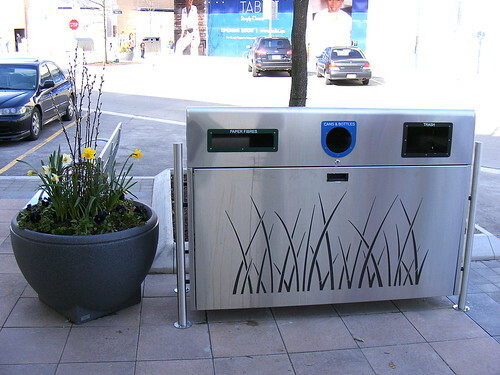 There’s bike racks, stylized versions of the old Eucan garbage bins, benches, and speakers playing background music. It is hard not to notice the new stores opening have a up-market mix, compared to the old mall, which while tired, had more neighbourhood-oriented stores like a Shoppers Drug Mart (moved across Lawrence to a new strip plaza) and a Home Hardware. New stores target a more moneyed clientele – indeed, one of the features of the complex is valet parking next to the parking garage at the northwest end of the development. However, one of the new stores is rather exciting – McNally Robinson, a small Canadian chain of book stores, is one of the anchors – finally some local competition in the large-format bookstore market against the Reisman empire of Indigo/Chapters. The new shopping centre is a perfect example of the types of “Grey Spaces” that the latest issue of Spacing discusses. There is an extensive internal road network, interesting street furniture, and a mix of facades to give the illusion that this is a bona-fide shopping neighbourhood. But this is a managed, private space, and Cadillac Fairview security guards patrolling in Smart cars remind you of this. However, street signs on the private lanes look the same as the new signs being placed by the City of Toronto across the city. The centre is not yet finished. The part along Don Mills Road continues to be lined with surface parking lots, though this and is slated for mid-rise condo development, and will face the proposed Don Mills LRT line. 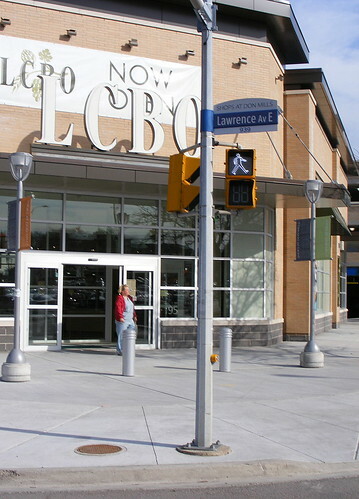 Right now, the only store to face a public street is an LCBO outlet, at the corner of Lawrence and The Donway. In the middle of the complex is a central square, with some interesting art, fountains, and a planned winter iceskating rink, again replicating public uses that one would find downtown. 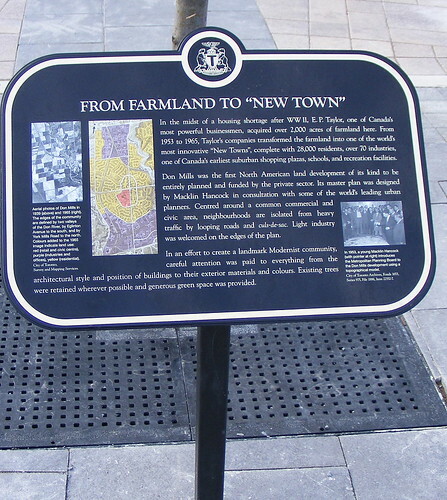 A series of new historic plaques detail the history of this first true post-war suburb of Toronto. And on Lawrence, wall-art that was part of the 1962 Eaton’s store was wonderfully preserved. I have mixed feelings about Shops at Don Mills, though I guess I would consider this to be a very interesting and at the least, a well-intentioned development. The local community lost a local meeting place and a shopping centre that served their needs. There’s also something vaguely Disneyish about the place as well, almost something out of the Truman Show. But as a private development, while still not complete, is worthy of discussion. The best part about this development is that it is not located somewhere north of Vaughan but right in the city. Compared to Easton Town Center in the fields outside Columbus, or the Dulles 28 Centre far outside of DC, or virtually any other “center”, this is positively radical. Even Atlas Park in New York, one of the few faux-urban centres actually located in an urban area, is in an obscure corner of Queens that is hard to get to via bus, never mind the subway. Because of its great location, Don Mills has a real chance to now experience infill and connect to the future LRT, which is quite exciting. Good analysis. Got to go down there and check it out sometime (it can be a bike trip as it is not that far from the Don valley trail 🙂 I wonder if most people care about this distinction between grey space and public space though. I read “Edge City” a while ago the author suggests that many (if not most) people actually prefer grey space to public space, precisely because of its managed, Disneyish nature. I am not so sure myself, but I can understand why many people like it. While I think this is a step in the right direction – I think it holds many of the same problems of the shopping mall. It’s presented like its a neighborhood, but from looking at the photos – it’s apparent that most of the buildings are still single story retail. If you added a few stories of residential on top of the retail – I think this would be a really great development. In the top photo of the last batch, what on earth is that thing on the right? It looks like a lamppost holding up a bunch of houses on sticks. Thanks for the article! I, too, have mixed feelings, but I’m interested to go check it out. Electric> That’s the public art by Douglas Coupland. “Housewifey shopper distractions,” hmm? Thanks again, Shawn! Yes, great to see the bike posts. I used to ride to the Don Mills mall in the ’80s, and was irked that there was ZERO bike parking (I used a stop sign post in the car parking lot). 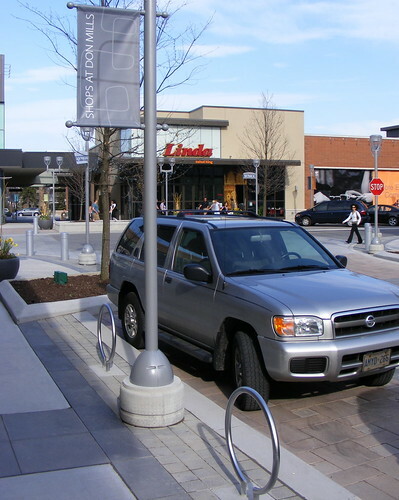 I petitioned Cadillac Fairview to install some bike racks but that never went anywhere. It’s excellent to see this evolution in corporate thinking. I took a walk around one night a month or so ago and got a very different impression of being underwhelmed. This is likely because at that time the central areas were still fenced off, and so I was limited to the perimeter. 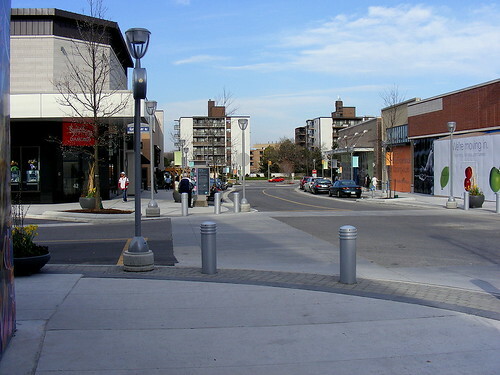 The site is largely inward facing, so you have a faux-urbanized interior space but the face that is presented to Lawrence and Don Mills is still automobile-scaled with little of interest that would generate much pedestrian activity (e.g., long sections of blank walls along Lawrence; parking garage fronting the Donway; slightly less parking along Don Mills). Certainly they could have done a lot worse (Trinity Common in Brampton also has a faux urban crossroads but it is in the middle of acres of parking and big boxes, plus all the buildings along the intersection face outward toward the parking lots!). I’m not convinced that this couldn’t have done better… I guess it depends on what your design objectives are. It will be interesting to see if the overall site dynamics change as the additional residential units are added. 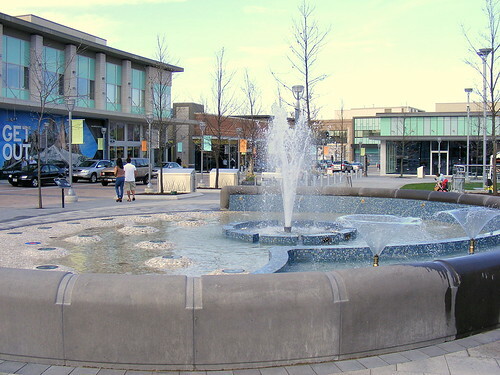 Reminds me similar development in Emeryville California – Bay Street Mall (http://www.baystreetemeryville.com/). Advertised as a main street with housing (expensive condos) above retail (high end shops). The back of the mall faces a public street which makes for a dead public pedestrian space. The mall/ main street itself is fairly popular. I’d agree that any non-automotive approach to the centre is pretty much the same as before: a big parking lot looking onto the outside walls of the buildings. The “streets” themselves really felt like some sort of film set, as has been implied above, or maybe an amusement park. The music that was being piped in (with shockingly tinny speakers) would have fit right in at the Ghostercoaster line. I’m certainly not totally against the place, but I’m definitely not yet impressed. I’m a little intrigued by the fact that this privatized public space seems to have less advertising and commercial intrusion than we allow any of our real public spaces. I used to live in Seattle, where many of the malls are entirely or partly outdoors. There, it worked — though it was disturbing to see people drive instead of walk to the other end of the mall, much like they do at big box centres. But here, indoor malls have a big advantage if the weather’s lousy during the crucial Christmas shopping season. Yorkdale’s newest section looks a lot like a street (storefronts are windows & doors instead of gaping holes), but you never have to bundle up to go from store to store. As for whether it’s a big deal this is happening in Don Mills, the big traditional malls in the 416 aren’t dead — despite all the predictions that they should be. Off the top of my head: the Eaton Centre added a couple of anchors, Toronto Life Square may be ugly but it’s brand new, along with Yorkdale there’s been a big reno at the Dufferin Mall and a minor one at the Atrium on Bay, and there’s a proposed expansion to the Yonge-Eglinton Centre. I too have mixed feelings about the project. I happened to be driving by the site one night last week at about 9:30 pm. It was still quite busy with people on the grey streets and shops lighting up the sidewalks. In many places it really felt like an actual main street – with the curbs, parking, bike racks and sidewalks. Although a good number of the shops are one story, there appeared to be some streets with two and three story offices or perhaps future residences above the stores. Too me it still felt like a mall – but without the steroids that many malls give the impression they are taking – that look at me in your face architecture. If this catches on, one can only assume that over time this could increase awareness and desire for public main streets. I’m also wondering if the Disney feel is partly due to the fact that everything is new – where a real main street in Toronto has buildings from many eras. It will be interesting to see if other developers use the same relative care shown by Cadillac Fairview. 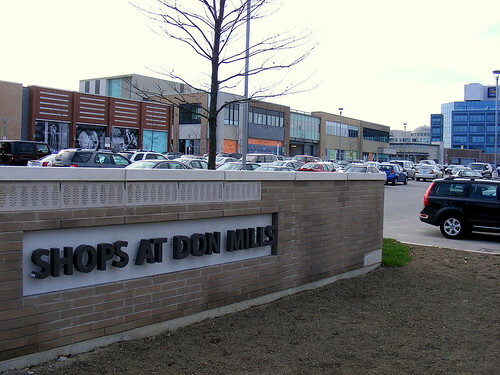 I love the new Don Mills, it reminds me a lot of Oakbrook outside Chicago. And my absolute favourite store is there Anthropologie. I wish all the retailers in the development huge success. I should also mention that there are at least a couple of mall infill plans in the works (e.g., Steeles/Don Mills; York Mills east of DVP. Sorry, don’t have the mall names at hand). But those ones consist of building condominium towers in the outlying sections of the parking lots while leaving the malls more or less intact. Two examples that are under construction or recently completed — Sherway Gardens and Bayview Village. This will be another interesting trend to watch out for. Further to Brent’s comment, some development applications to replace malls entirely are in the works, such as for Honeydale, but nothing has been heard from on that front in a long time. I suspect, like everything, that some malls are thriving and in no danger of disappearing, while some are dying and will be replaced. I took a quick look at this mall today. It all seemed terribly upscale – read costly. Is there anywhere to eat or even have coffee for “less” other than Piazza Piazza. There must be. I felt like I was caught on the set of a retail version of The Prisoner. It will be interesting to see how the nearer and wider communities react to “the Shops” as time goes by. shopping area. The closest are Fairview Mall, Bayview Village (which is far) and East York Town Centre (formerly known as Thornciffe Mall) that has been going down hill since the 80’s! Finally a space that has amazing stores and we can enjoy the outdoors on a beautiful day. If it rains, that’s what umbrella’s are for! The only thing I wonder about is what’s going to happen during a snow storm. Maybe Cadillac Fairview will surprise us and have heated streets that will melt the snow away. I must agree with Jordan. There is nothing but commercial retail. We need to see mixed-use development, or it’ll just be the same type of non-neighborhood providing nothing more than options for consumption in slightly different packaging. Why are we still allowing this type of development? And you know there are tons of stores that aren’t inside malls that are open year-round too. For instance, any store on a street. We’re Canadians. We know it snows in winter. The new mall is all very pretty but the stores are all upscale and expensive. Who needs four ladies’ spas in one place? 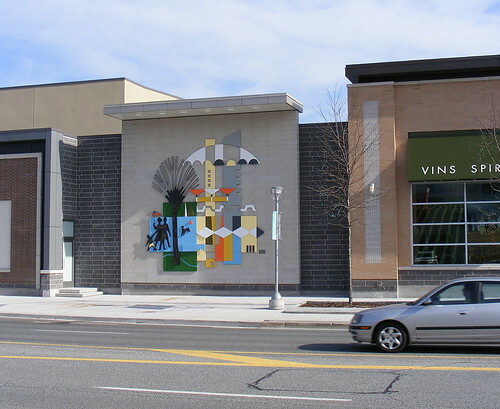 It is not a neighbourhood shopping place except for the Metro Store, LCBO and the bank. When I need something like linen or stationery I drive elsewhere. I am not paying $100 for a bra in the fancy lingerie store! Perhaps when they finally finish the place (with at least 50% of the stores still empty) they might have a better mix of retailers. Perhaps Cadillac Fairview can’t find enough high-end retailers to pay the high rents! One also takes their life into their hands as cars prowl up and down the interior streets and ignore the stop signs. On a cool or rainy day the place is empty. We will have to see how busy it is come winter and everyone heads off to the indoor malls to shop in comfort. If the old Don Mills Centre wasn’t making $, I don’t think it was because it was an indoor mall….I think they needed to work on that more. Perhaps a multi-tiered parking garage was needed? more entrances? I might enjoy the New Shops on an early spring day, when I’m drying to walk outside. But in the humid heat of summer, or the sleet, wind, snow of winter I’d rather be indoors. Plus, it’s very upscale, so the market is limited. This is Canada, and we get WEATHER, lots of it. The shops will only appeal when our WEATHER is being agreeable. Also note: Not ONE parking spot in front of the shops was available that I saw…so in/out shopping is impossible as well. So, it IS a mall, just one without a roof. I’ve visited this place a couple of times now and really like the layout and concept. The only problem is that alot of the shops can be found at other malls. For example, coach and feet first. i think it would’ve been much more interesting and to have more unique shops at this location. It would give people more of a reason to go there as opposed to a Yorkdale mall. I think they should add some stores that are a little less expensive such as Gap, H&M or Zara just like Yorkville has. Since there are a lot of people who might enjoy occasionally buying items at stores like Coach or Anthropologie but might not have the budget to afford these stores all the time. This might turn people off visiting this complex.